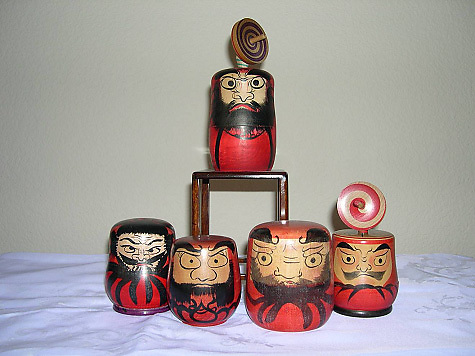 These wonderful little men are also made by kokeshi makers and some are made as toys. The daruma legend came from India and it is about a man who sat on a wall and worried about the problems of the world. He lost his legs from non use and his arms are folded around himself under his gown. They are such wonderful creatures!! The ones with the spinning tops are used as dice, and this is indicated by the numbers and directions (e.g. North/south/east/west) painted on the top. When the spinning top stops and tilts, it is read like a dice.